TANGIBLE, SUSTAINABLE GROWTH WILL COME FROM BUILDING AND NOURISHING STRATEGIC RELATIONSHIPS … NOT JUST SALES. In what researchers now describe as “the Era of a Kinship Economy,” leveraging strategic partnerships is increasingly critical to your company’s growth. To get and stay ahead of your competition, you need partners. And not just any partners. You need strategic, Fortune 1000 powerhouses. Partnering with giants is complicated, but most companies, even the smallest ones, can benefit from creating such a bond through a strong business development (BD) effort. 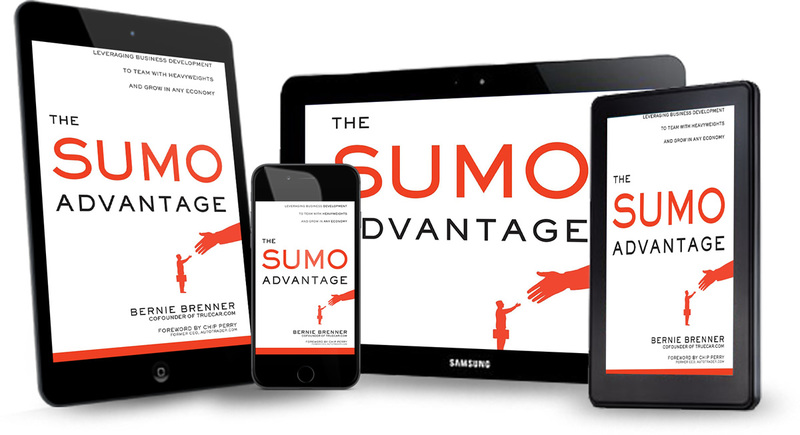 In The Sumo Advantage, you’ll learn how to build and sustain BD initiatives that will propel your enterprise. You’ll learn how to design and build your company’s BD LayerTM to turbo-charge sales ef- forts and growth. You’ll discover how to identify potential partners and entice them to partner with you in a win-win scenario. You’ll also begin to understand the key terms of a successful partnership and learn how to negotiate to get them. Finally, you’ll learn how to identify the best BD possibilities, and get the most out of every strategic partnership.